Today Samsung announced the release the Galaxy Note 8 Enterprise Edition in the US, which takes the core Samsung Galaxy Note 8 and stuffs it with options that should be appealing to business owners looking for a common smartphone for all employees. 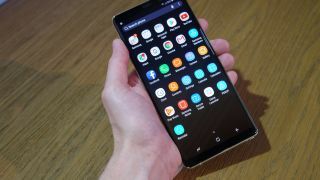 It's an unlocked device as a result, with some of its chief attractions being Samsung Knox Configure and Samsung Enterprise Firmware Over the Air, which let IT administrators easily configure the devices remotely and update every device in the system at once. The system comes with other perks as well, such as the option for companies to buy the same model for up to two years after launch so their IT crews aren't having to worry about rolling out software for a bunch of different devices. Samsung is also committed to providing the Note 8 Enterprise Edition with monthly security updates for three whole years, which should lessen some of the worry about company devices getting ruined by exploits and malicious software. If your company buys the devices through "authorized Samsung channel partners" in bulk, you'll end up paying $994 (about £750/AU$1,295) for each device, which is only slightly more than a Note 8 "phablet" costs for the consumer market. And make no mistake, aside from its unlocked nature and the IT team-friendly software, it's basically a standard Note 8 with 6GB of RAM and 64GB of storage. But that's a good thing. As we said in Galaxy Note 8 review, the "Note 8 is Samsung’s big phone comeback story, making up for last year's Note 7 recall." Unfortunately, the Note 8 apparently isn't without its own significant problems, as Android Police noted today that many users are reporting that the device freezes up when the Contacts app is open. Hopefully it'll get fixed soon. The Enterprise Edition appears to be currently limited to the US and South Korean markets, but a wider rollout may be possible in the coming months.